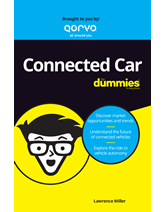 Qorvo has written a new resource, Connected Car For Dummies®, to help you learn more about the RF technologies, trends and standards influencing the automobile marketplace. Download your free copy of our new e-book below. Please fill out this short form to get your free instant download of Connected Car For Dummies®.